Can Cat Litter Trigger an Asthma Attack? Show your furbaby your love by taking care of his health. If your furry feline has asthma, you may notice symptoms and behaviors that scare you. Any previously healthy cat who begins to cough should be seen by his veterinarian right away so the vet can examine and assess his condition. It could be asthma -- or it may be nothing. Feline asthma is a chronic condition that mimics the symptoms of human asthma -- coughing, wheezing, open-mouth breathing, labored breathing, especially after exercise, lethargy and weakness, and bringing up a foamy mucus from the lungs. During an attack of asthma, your cat’s airways become smaller, making breathing difficult. Look at his posture. If you see him gasping or breathing quickly, squatting with his shoulders hunched over and his neck extended, he’s trying to breathe. His tongue and gums may develop a bluish tinge. Pick him up and look into his mouth. If you see a blue color, he is having trouble getting air. Cat litter can lead to asthma attacks in your feline furbaby. If your vet diagnoses him with asthma, his litter could be one of the first possible triggers for his attacks. 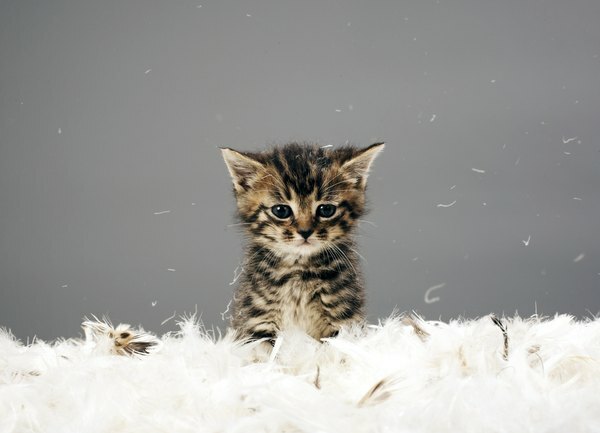 Some litters are very dusty, which can lead to an asthma attack in your cat. Your cat may have one of several triggers, including mold, pollens, cat litter, perfume, some foods and cigarette smoke. He could develop allergic bronchitis, which means that his airways become inflamed when he inhales one of his triggers. Cat litter -- that cat supply you buy to allow your family feline to use to bury his body wastes -- has many of the characteristics that can lead to an asthma attack. A scented cat litter can certainly help to kill those not-so-lovely body waste odors. But if your feline is allergic, it can cause asthma attacks. Cat litters can be dusty. When you pour fresh litter from the bag, you may react by holding your breath to keep the dust out of your throat. Your cat won’t know to hold his breath as he does his business. Litter made from clay can also cause issues for your feline. Read the package to make sure your litter of choice doesn’t have any of these characteristics. Should your vet diagnose allergy-related asthma, begin changing your cat’s litter. Make the change slowly by using one litter box with his old litter and a second box with the new litter. Because cats are creatures of habit, you will need to make the changeover slowly over weeks. Begin combining the new litter with the old brand -- gradually increase the amount of new litter you mix with the old until he is reliably using the new brand. Dust is one trigger for human asthma, according to the Lung Association of Canada. Because cat litter, especially the clay-based version, can become dusty, if you have asthma and own a cat, you can experience an asthma flare when you clean a cat litter box or change the litter from used to fresh. If you are too attached to your furbaby to give him away, get another human to clean and change your cat’s litter box. If you find you do have to cover litter box duty, buy some inexpensive paper face masks and slip one over your face before starting. While it’s not the height of fashion, you can avoid an asthma flare. If you have asthma but you haven't been adopted by a cat, think carefully about your health and decide if being owned by a feline furbaby is the right thing for you. Do Cats Have Phantom Tail Pain? Can Cats Give You Asthma? What Do I Do if My Kitten Is Hiding?